Success: Seward Profile is sourced! 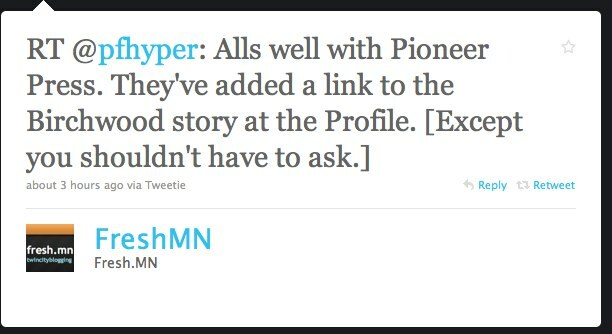 Following up on the last two posts, the Profile blog is sourced at Kathie Jenkins' Pioneer Press Restaurant column. Well, sort of. Seems somone forgot the opening "<" of the <a> element resulting in a missing link but a visible URL. I did send along a note to Ms. Jenkins informing her of the issue. Ms. Jenkins apologized and explained that it was a last minute item written under deadline and she simply forgot. Thank you, Kathie. Accidents will happen. For me, I still have this lingering doubt that not sourcing the Star Tribune or New York Times would have triggered an alarm along the way. Somebody must look over the content besides the writer. Of course if I'm a copy editor and I see "neighborhood blog" I have no idea what blog she is talking about. It would seem a good starting point to refer to the name of the blog in full (in this case Seward Profile). Then if you forget the link, someone would have a clue as to where to look. I'm realizing I should have asked for naming the blog in my email. Darn. A name without a link is arguably better than a link without a name. Erica at fresh.mn was kind enough to retweet and link here. I'll close with her (re)tweet as I think she makes a good point. This entry was posted in Uncategorized and tagged journalism on April 2, 2010 by Peter Fleck. Kathie Jenkins at Pioneer Press read the Seward Profile story on the Birchwood Cafe expansion and then wrote about it in her Restaurant News column (“A Tree Grows in Seward”). She sourced a “neighborhood blog” and didn’t provide a link. Profile is one of my projects and Kathie, I’m happy to provide you with easy-to-serve copy-and-paste material but how about at least linking back to the source? Hey this is the web! You can still fix it! Just send folks to: http://sewardprofile.posterous.com/birchwood-expansion-plans-update-from-tracy. Thanks.